This was the question that framed a one-day workshop/conference on economic justice held at Toronto City Hall last Thursday. The event was sponsored by Faith in the City, who organized an interfaith gathering of religious leaders meant to examine how people of faith can contribute to economic justice in Toronto. I learned a lot in the sessions, but while the conference was excellent, I’m not going to give an account of all the talks and workshops here. Instead, I’m going to pick up on a metaphor used to describe the work of charity vs. the work of justice. Briefly, the speaker painted a picture where all of us at the conference were at a riverside park enjoying ourselves with a big potluck picnic we had each contributed to, when suddenly a drowning person is spotted floundering in the river. We all rush down and manage to pull them out to safety, but just as we begin to congratulate ourselves, we spot more people, and more people, and more people coming down the river. The rest of the day and into the evening is spent pulling people from the rushing water, feeding them from our picnic potluck, helping them dry off etc, until someone finally says we need to go upstream and figure out who or what is pushing these people into the river and stop it! The distinction drawn is that charity, of course, is the necessary work of grabbing people out of the river before they drown, but justice is going “upstream” to try to stop them falling in in the first place. This is a lovely and very instructive metaphor, and a good one in many respects. But reflecting on it as the day went by, I felt it needed to be modified a bit. Certainly, every person in that room was willing (and probably already working) to pull struggling people out of the river. But weren’t we all also, at the same time, part of the problem? Sitting in the session titled “Advocacy 101” and hearing, for example, about how we have to be sure that we are not accidentally oppressive in our very attempts to do justice, I saw each and every one of us--even people at this conference, people interested in working for justice!--as part of a society that systematically harms the already marginalized. So… here we are, in the middle of the problem, trying to live in such a way that we are making things better, not worse. In our hurry to “go upstream,” we weren’t seeing that we were, and are, already there. And as that thought struck me, I suddenly had an image of myself floating down the river, looking desperately for something to cling to. Certainly there have been times in my life when I have needed a safety net, and I’d wager that most of the people in that room--and indeed, most people in general--end up struggling in the river at some point in their life. In fact, the more I looked at that metaphor, the more I saw each of us in all three different places--all of us standing “upriver” as part of the problems causing people to fall (or be pushed) into the river; all of us floating down the river, struggling to find something to grab on to pull ourselves out of the river; all of us standing in the park, trying desperately to drag drowning people to safety. Of course we need to make sure that people keep getting pulled out of the river when they fall in, and we need to figure out what is wrong upstream. But just as the guilt was hitting me about being part of the problem, another realization came as well: the fact that we are all already upstream means not just that we are part of the problem, but also that we are already situated to have an effect on “the problem” (which is really a whole set of complex problems). We are already in the many of the places we need to be to use our talents to make the choices and begin to sort out the changes required to make society more economically just. We are not only culpable, we are also capable. And that is good news, is it not?! This coming May 12-13, we at the Centre are co-hosting a conference on exactly this topic: economic justice. Along with our partners, we will be bringing many people from all over Canada and beyond, from many different areas of society to lend their talents, their expertise, to discuss how we can best deal with these “upstream” problems. We were born upstream, all of us in this time and place--certainly anyone reading this post. But that is a cause for hope and motivation, not despair or hand-wringing. The fact that we are all already in three places at one time means that there’s a lot of people we can join hands with, a lot of resources out there that we can pull together, and a lot of good we can do: upstream, downstream, and in the river itself. When we all use our different gifts, skills, and resources together, we can accomplish so much more than any of us could on our own. That is something to celebrate, when we take it up as a task to which we are called. 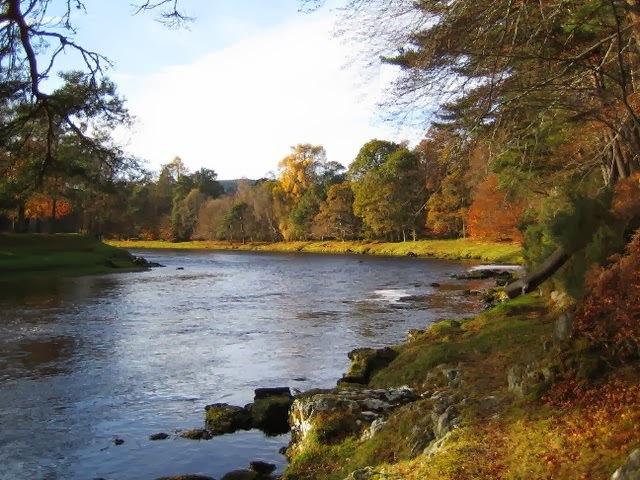 First photo by Nigel Corby, used from http://commons.wikimedia.org/wiki/File:Autumn_on_the_River_Dee_below_Hill_of_Trustach_-_geograph.org.uk_-_610895.jpg. Second photo by Chensiyuan, used from http://commons.wikimedia.org/wiki/File:Toronto_skyline_toronto_islands_b.JPG. Hi Allyson, thank you for sharing your empathetic pondering of the metaphor. I only just read it, but I was along with the metaphor. When I was thinking about being at the potluck, and seeing a person in the river, I could imagine being very heroic and rescuing that person. But then more people would make it seem like more work. And soon, we would be tired and our resources would be depleted. We would be weary, and wondering when the police will come! When you were talking about your laptop, our energy, where our lunch comes from, it made me think that we have the luxury of choosing our proximity to the river, or even ignoring the river altogether. We can choose to skip the potluck of proximity. I think that is an important element to the metaphor too: our choice to be there. Thanks, Jonathan--you raise an excellent point. While I don't think any of us have a real choice about being upstream or in the river (although we certainly can and do choose each day how we act upstream) we definitely have a choice about whether we are in the third place on the river bank trying to help, or even eating at the potluck the metaphor spoke of. And those too are important choices to make. Even choosing to participate in the "potluck" with people from all over the city and community is something that makes a positive difference, as we get to know each other and make connections with people we may not have met or worked with before.